Testing has been going on at Spa since Tuesday but the times tell us little - the weather has been changeable, at times making the track wet in some parts and dry in others, and the time sheet looks a bit odd as a result. On Tuesday, Lewis Hamilton was quickest and yesterday it was Massa's turn. But the meaninglessness of that is really illustrated by the fact that Robert Kubica has been the fastest so far today - by 1.5 seconds! Spa is so magnificent that we can forgive it anything, including variable weather. It is such a relief to see it back on the calendar after its absence last year - and the alterations made in the interim have made it even better, apparently. The big change is the Bus Stop chicane. It has been altered so that the cars no longer have to tiptoe around such tight little bends, looking ungainly and unnatural as they do so. 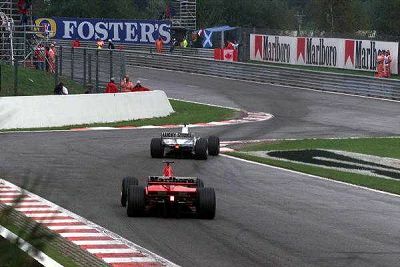 We became used to the Bus Stop over the years, perhaps even enjoying the sight of drivers bouncing the cars over the curbs in their efforts to straighten it out, but really it was far too restrictive for the F1 cars of today; it was almost a restart for every lap. So any change to the Bus Stop could hardly help but be for the better and the overwhelming consensus is that the new chicane has helped enormously. Jenson Button is even of the opinion that it might encourage overtaking! The pits, too, have been improved and are now in line with modern standards. But the pit lane entrance is causing some concern; it is bounded by concrete walls (and we all know the disastrous effects that they can have with Kubica's Canadian GP accident still so fresh in our memories) and is very narrow. The drivers have been complaining that the entrance is blind and very dangerous therefore. It seems to me that the simplest and most effective solution would be to knock down the walls and leave it at that. Otherwise, the big news concerns driver changes. Toro Rosso have the services of Sebastien Bourdais as a test driver for a couple of days, giving fresh impetus to the assumption that he will drive for them in 2008. He is being cautious in his answers to questions in that regard, however, pointing out that no proposal has been made as yet. Honda have released Christian Klien to test for Spyker at Spa but the Dutch team insist that this does not mean he will be taking Albers' vacated seat for the rest of the year. It looks likely, however, and may just be a matter of getting Honda to agree to an extension of his release. Of all the possibles, Klien would be the best option from the point of view of Spyker's competitiveness. The Austrian has considerable experience in both testing and racing, which is just what the team need to put alongside Sutil's promise as one of the latest batch of young hot-shoes to enter F1. For Klien himself, it may not be such a good idea, however. Apart from the fact that he would be returning to racing with the weakest team on the grid, he would also have to show that he is at least as quick as Sutil or his chances of another F1 drive might disappear forever. A difficult decision for him, I think. Ah it's great to see F1 back at Spa which always seems to produce a great and exciting race! The main change sounds fairly good I just hope they haven't messed with a winning formula, if it aint broke don't fix it. Overtaking improving well that sounds good already on a track that is quite possible to overtake on. Good to hear Klien is still around he did show promise at one point while driving for Red Bull but not enough. It's always a dangerous move going to someone rooted at the back of the grid, you don't know how big an improvement they'll get and how long they can survive. All true, Pootle, and Spa is easily the best race every year in my opinion. I sometimes wonder how many drivers' careers in F1 have come to an early end thanks to their only being able to get drives in the slowest teams. It must be very hard to shine in a Spyker - "Ooh, look at me, I managed to get this heap into 19th spot instead of 22nd..." Doesn't look great, does it? I doubt Klien will get to race the Spyker - he's being very careful to do everything with Honda's agreement, and I doubt Honda will agree to release their tester for the rest of the season. It's not as if Honda are running away with the championship at the moment... I understand why Klien is testing now - Spyker will value a different, experienced, paying perspective and Klien appreciates anything that makes him more visible in the F1 world as he looks for a race seat. Personally, I'd like to see Markus Winklehock get the drive - he looks quick, knows the car and if he's not so quick in 2007, then he'll probably get 2008 in the Spyker to show what he can really do. Adrian Sutil is showing that it is possible (albeit difficult) to shine in a Spyker. You're probably right, Alianora, but I still think Klien is the one with the best chance. Honda already has two good, experienced testers in their race drivers, Button and Barrichello, and would not miss Klien's skills much therefore. The fact that they have allowed Klien to test for Spyker at Spa must surely mean that they are open to at least considering whatever Spyker might suggest. Of course, money may well be the deciding factor, which puts van der Garde and Karthikeyan into the picture. Both have contractual complications (let's not forget that Super Aguri have some claim to van der Garde - I don't think that was ever sorted out) so it's not as simple as might appear.